BirdieBalls and the Electronic Swing Groover II are two golf practice traing aids. 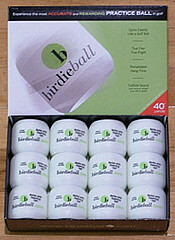 BirdieBalls Box of 12 -the limited flight practice golf ball that you can hit anywhere. It’s the best golf training aid invented this century. What’s so unique? It has a limited distance of 40 yards but it feels and flies just like a real golf ball. It draws, it fades, but with a limited range so you have your own backyard driving range. Pros like it because its unique shape and center of gravity allow it to spin, and therefore, it reacts just like a golf ball. Beginners like it because it’s a fun way to learn golf! 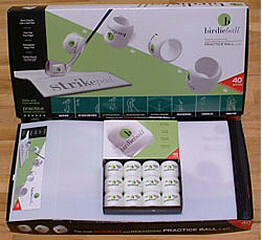 BirdieBalls Box of 12 with Strike Pad -It won’t break like a wiffleball or other perforated practice balls. It comes with a Strikepad™ so you won’t take divots out of your turf and therefore, you don’t need a golf mat or any other turf pad. Birdieball is made of a high modulus engineered polymer that can withstand a 125 mph swing.